Once you find a Ning Network that you’d like to join,Â signing up is a breeze. Just click “Sign Up”Â at the top of the right column of the page. You’llÂ be taken toÂ the sign up page for the Ning Network. First, type in your email address. You’ll enter this email address every time you sign in to the Ning Network, and all notifications willÂ arrive in this email’s inbox. Next, enterÂ a password. If this is the first time signing up for a Ning Network, this is your chance to create a password. Otherwise, just enter the password you’ve already created for your email address. Retype your password to confirm that you’ve entered it correctly. Use the drop-down menus to enter your date of birth. Type in the text exactly as you see it in theÂ imageÂ on the right (called a CAPTCHA). This step ensures that you’re a real person and is an important security measure. Click the “Sign Up” button to join the Ning Network. 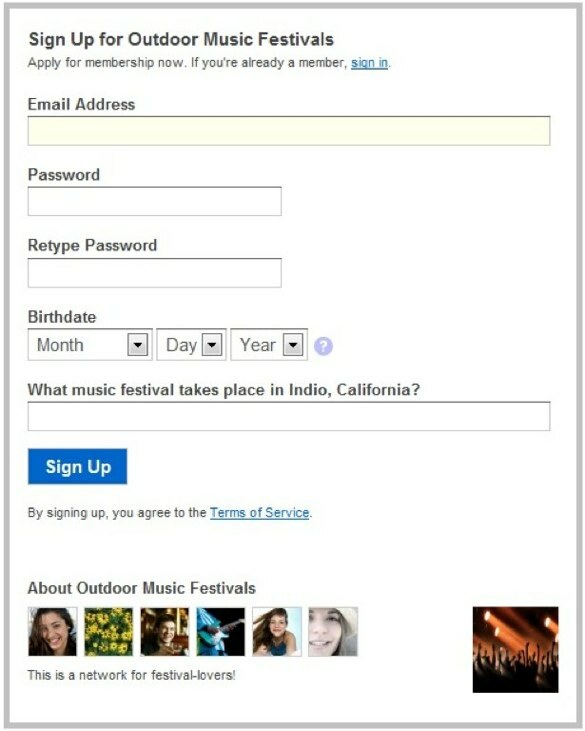 By signing up, you agree to theÂ Terms of Service, which you can read by clicking on the link to it on the sign up page.